At the end of last week I was walking down the stairs and my eyes landed on our black cat. I was struck with the thought of how black she is. Then it occurred to me that we have had a lot of rain, a lot of days without hours and hours of sun. I call Teagan my Sunshine Girl because she LOVES to be in the sun. She will go from window/door to window/door to get the most sunshine throughout the day. She will sit in the sun until she is so hot it makes me wonder if it is good for her. When she sits in the sun hour after hour she starts to rust. Yeah, it’s a real thing. Black cats can “rust”, their black coats start to turn a lighter shade, it becomes somewhat brown. It kinda looks like rust. According to Wiki the black fur pigment is fragile and cats that sit in the sun a lot “rust”. The black fur pigment is called eumelanin. Information on the internet also states that a tyrosine deficiency could cause a black cat’s fur to turn red. If a cat is being fed a nutritious diet of food formulated for cats, this type of deficiency is rare. I am confident that Teagan does not have a tyrosine deficiency, especially since she was so black. I have noticed her rusting in the past, I think that is why I noticed her total blackness recently. It took me a while to acknowledge she was a deeper black than she usually is. 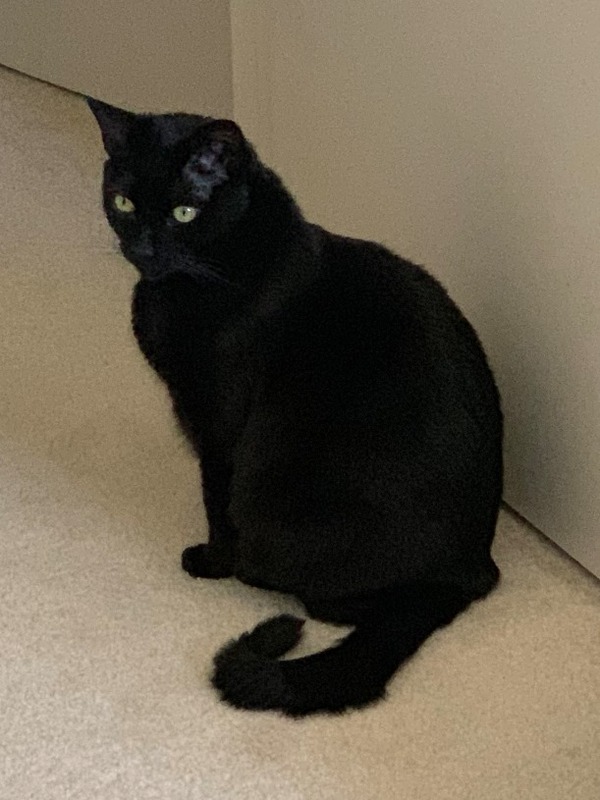 She is always a black cat, but as I said, it just occurred to me that she was very black with hardly any of the brown undertones. I say “was” because the sun has been out for days now and she and her sister are taking advantage of it. With the temperatures warming up to hot (for me) the doors have been open pretty much most of the day for the past few days and both cats have been parked in front of one of them soaking it up. I think Teagan might already be starting to rust. To me the rust looks like it starts in the undercoat and not at the ends as does a bleaching of human hair in the sun. I could be wrong, but it seems as if the brown is more visible when her fur is brushed one way or the other. If the cloudy days are gone, then Teagan will continue to rust and get lighter and lighter as the days go by. Have you noticed a cat rusting? Ahhh, I was looking up black cats, because I was curious. When we were thinking about adopting the cats we have someone mentioned to me that it was hard for black cats to get adopted and she had to explain it to me. I mean, I am aware that there is a superstition around black cats, but I didn’t know that was what she was talking about. I think it is sad that a lot of black cats don’t get to live because of superstition. So I looked up Black Cats and Wiki told me otherwise. I mean in addition to there being a superstition that black cats bring bad luck, there are some countries that think black cats signify good luck. So YAY! 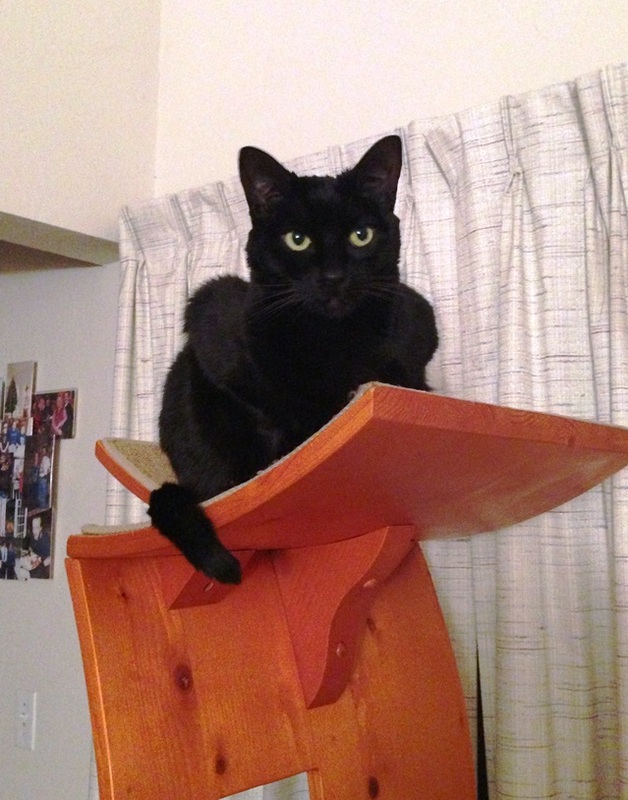 Some believed black cats could shape shift into human shape. Some thought they were so evil that there were mass killings of black cats. But some sailors thought having a black cat on the ship brought them luck. And some sailor’s wives kept one at home thinking it would protect their husband’s at sea. Pirates believed that the kind of luck brought by a black cat depended on the direction of its path, if it walked toward a person they would have bad luck, but if it were walking away they would have good luck. But in the United Kingdom they thought the opposite, coming towards a person good luck and walking away bad luck. So, really what the superstition of cats being bad luck equates to is black cats having lower adoption rates as cats that are not black. 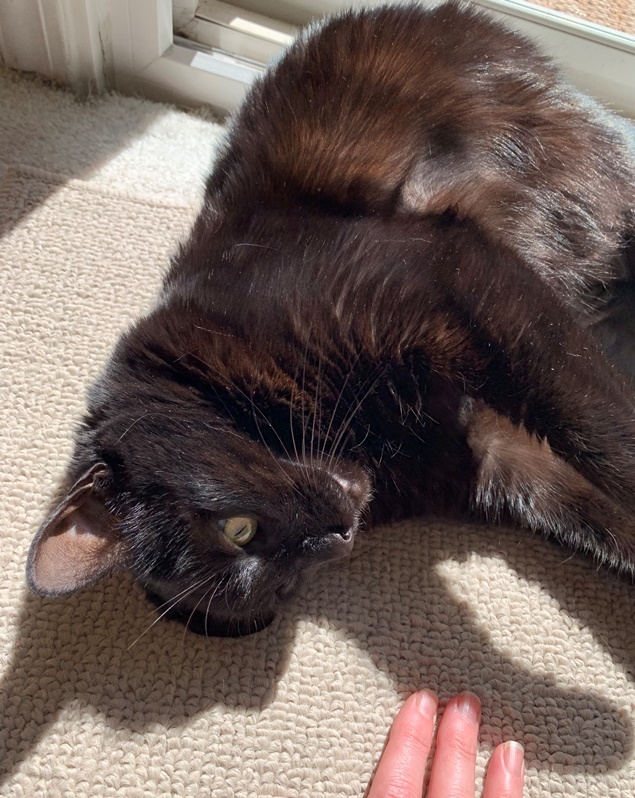 If you don’t have any sort of hang-up about a black cat and you are going to adopt a cat, I would encourage you to look at black ones first. Some people prefer to have black cats. I’ve never had any superstitions about black cats so aside from not wanting two cats, I didn’t have a problem adopting a black cat. Although, I will admit that both me and my husband had a period of adjustment when the cats came home and were allowed out of quarantine. It was odd to have dark cats walking around. We were used to a lighter cat . . . a tabby. So a black cat and a tortie was kind of odd at first. Our black cat is a super sweet girl who always has a lot to say. We are LUCKY to have her! What do you think about black cats? Have you heard that the U.S. Food and Drug Administration (FDA) has banned antibacterial soap? Well, it doesn’t sound as if they are actually banning antibacterial soap and products, they are just banning most of the chemicals found in over-the-counter “consumer antiseptic wash products (including liquid, foam, gel hand soaps, bar soaps, and body washes).” The FDA is stating that “there isn’t enough science to show that over-the-counter (OTC) antibacterial soaps are better at preventing illness than washing with plain soap and water.” There is nothing proving that there is any benefit to using them. You may have heard the debate about antibacterial soap and products actually doing the opposite of helping us stay healthy. Some say that they actually could be making us more sick because they could possibly lead to bacteria that is resistant to antibiotics. Bacteria seems smart in that it gets strong when it comes up against something that is fighting it. In addition to the conclusion that antibacterial soap is not better than washing with regular soap and water, the FDA is saying that the manufacturers of said products have not proven that the products are safe to use over the long term. So, they have ruled that the chemicals used to create such products will be banned. Hand sanitizers and hand wipes, are not affected by this ban. Neither is antibacterial soaps used in hospitals. It looks as if one of the main concerns is a chemical called Triclosan. This is the one that has been shown to affect hormones in animals. Also, this is the one thought to help the bacteria get strong and become resistant to antibiotics. This chemical is used in pesticides along with a host of consumer products. So it seems as if we are being exposed to a lot of it — all the time. So the FDA has decided to have it taken out of the soap. It appears as if the manufacturers of such products have about a year to comply. But according to many things I have read on the internet many manufacturers are beginning to make the changes now. Could be they are just changing the labels, I mean who really knows with this stuff, right? Not every product is tested. I imagine if making the product without these chemicals is less expensive then with, then yeah, they will change their recipes eventually, since consumers are now being told they are on the non-GRAS list. So what do you think about this? 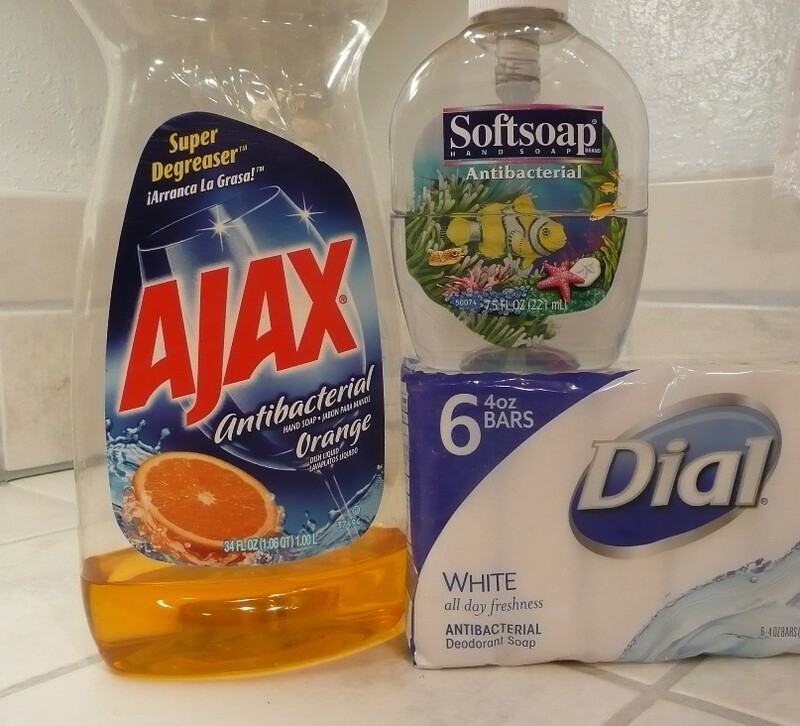 What do you think about antibacterial soap? The other day on my way home from teaching Nia I heard something mind-boggling on the radio. I had to keep repeating it in my head as I drove so that I could remember it when I got home. Of course, once I was home, I had to look it up. Now either I heard it wrong or they said it wrong, but either way, it is mind-boggling. Do you remember pet rocks? Those of you that did not live through the pet rock fad might not know what that is and when I tell you, if you have never heard it before, you are not going to believe it. What I heard was that the man who thought of it made a million dollars in two months. Well that is not really incorrect, just differently stated than the information on Wiki. He sold 1.5 million pet rocks in six months at $4.00 a piece. He sold rocks and made millions. That just struck me as funny that he made millions of dollars from selling rocks AS PETS. I mean, a lot of people sell rocks, there are rocks needed for buildings, fireplaces, walkways, decorations, and a lot of things, but a rock as a pet? That is hilarious. I don’t actually remember owning one, but I was at that age where I would have wanted the best pet there is to have, so I wouldn’t be surprised if I had one. I just don’t remember. I’ll have to check with my dad. He might remember selling them. At some period when I was a child, my parents owned a toy store, but I don’t know if it was at the same time as the pet rock fad. If it was, then I am sure we carried them in the store, but that doesn’t mean I got one. Funny things. If that isn’t funny enough on September 03, 2012, The Pet Rock was again available for purchase. I don’t know what they were selling for in 2012, but now they are $19.95. Yes you can BUY your own pet rock. It comes with a numbered certificate of authenticity. Do you remember Pet Rocks? Did you have one? Do you remember any other silly fads? Did you participate in any silly fads? So last Friday I received an organic produce box. And I was actually a little surprised because I thought I had selected what I wanted in it, but that must have been the box before. So I ended up with some things I don’t know that I would have kept in the box. You might remember I first signed up to receive an organic box of produce as a way to get “stuck” with fruits and vegetables that I would pass by in the store or at a Farmer’s Market. If I don’t know what it is, I am not likely to buy it and try to deal with it. But when it is delivered to me then I am “forced” to learn about it . . . .well, at least learn a way to cook it and/or (just) eat it. This past week we received Kiwi Berries. I have never heard of Kiwi Berries before. My hubby had kindly left the produce box on the counter and I was able to snap a few pictures then put the produce away then go off to my Nia class on Friday. I asked a couple of ladies if they had ever heard of them and they had not. At that point I had not really had a chance to look at them or look them up. It was receive and leave. While we were talking I quickly looked it up because there were curious, too. The pictures showed the Kiwi Berries sliced and they looked just like kiwis (the fruit, not the bird). These berries actually look like kiwis, but much smaller and not hairy. And when you cut them open they look exactly like kiwis. They are great. So much better . . . to me . . . . than kiwis. With kiwis you have to peel them and sometimes that hairy stuff gets on the kiwi and . . . . I just don’t like it. My husband says he doesn’t mind it. Well, that could be that most of the time when I give him a kiwi I have already peeled it and sliced it. I like to make it easy for him to eat while he is at work. So I am the one dealing with hairy skin. The Kiwi berries taste like kiwis except to me, they were a little creamy. I don’t think of kiwis as creamy, are they? I don’t actually eat a lot of kiwis so perhaps they are and I missed it. But the berries had a hint of creaminess to them. They are totally cool because you can just wash them and then pop them in your mouth like grapes or any other small fruit. Since they were such an easy to eat fruit, I didn’t even look to see any recipes or anything. Once I saw the pictures of them looking like kiwis I figured you can just eat them as it and we did. “Actinidia arguta (hardy kiwi) is a perennial vine native to Japan, Korea, Northern China, and Russian Siberia. It produces a small fruit resembling the kiwifruit. 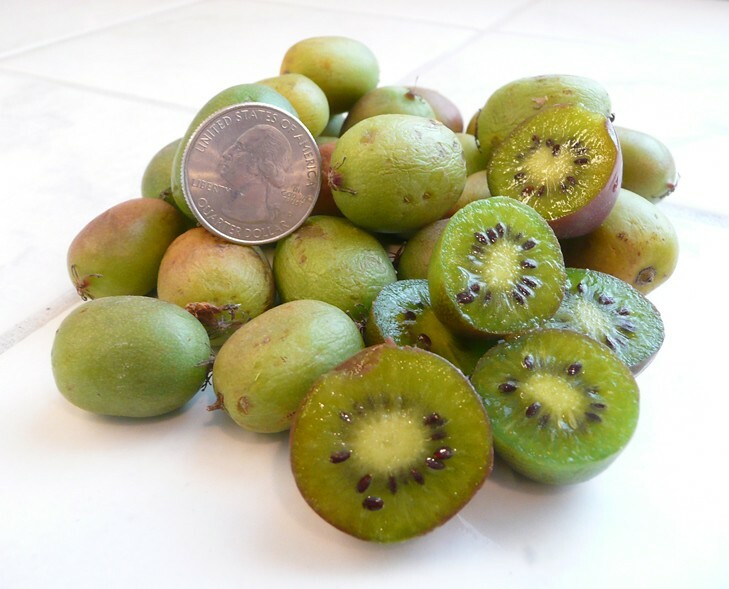 I am seeing sites that say the kiwi berries are a good source of vitamin C, fiber potassium, vitamin E, and magnesium. They are like bite sized dessert. If you like them, I am sure you can use them like you would use any berry or fruit; in a salad, as a topping for a pie, cake, or dish of ice cream or yogurt. They can be pack in a lunch or eaten as a snack. I am happy that I received something new to me in my produce box. That is one reason why I started getting it. But now that they allow us to pick what we want, I am not always being adventurous. Sometimes I forget to check my order. I am glad I forgot to check this week! Have you ever heard of Kiwi Berries? 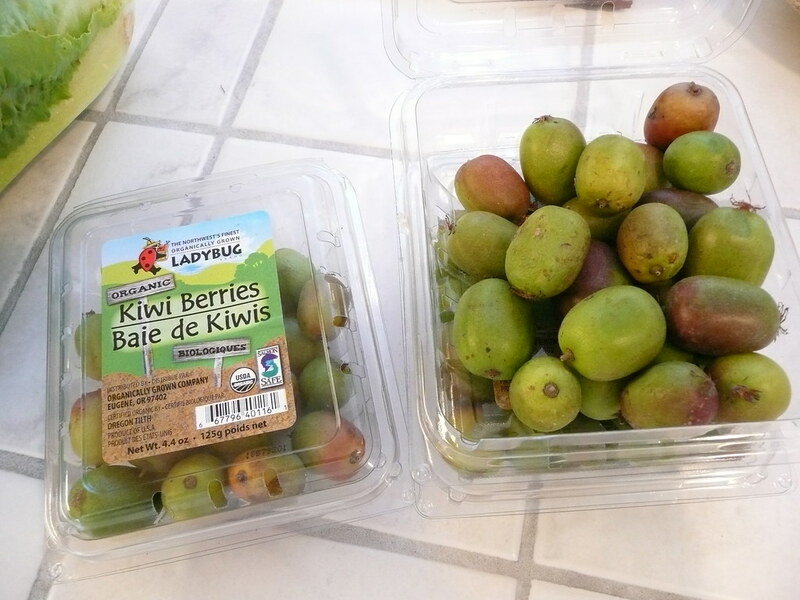 Have you ever had Kiwi Berries? Do you like kiwis? There were and are holidays and festivals and parades in Europe. Something I don’t ever remember seeing here. I think “ancient” is an accurate description, in regards to the US, anyway. Seems in the more modern times the acknowledgement of May turned more towards labor and/or politics. With Great Britain’s celebrations – at one point – coinciding with the last day of planting for the small towns and villages the farm workers would get the day off. Wiki further cites many celebrations of May Day still being held. Finland uses the day as an excuse to have carnival like festivities. France celebrates May 1st by giving ladies flowers. Lilies of the Valley. In Germany there seems to be a tradition of Maypoles and flowers. Not certain this tradition is still done today, but Maypoles with ribbons were placed in the lady’s yard by a love interest whereas ladies place “roses or rice in the form of a heart at the house of their beloved one”. Roses or rice? And May Day is a public holiday. Some places in Canada celebrate May Day but it sounds more like parades and celebrations for International Workers’ Day. In some parts of the United States, May Baskets are made. These are small baskets usually filled with flowers or treats and left at someone’s doorstep. The giver rings the bell and runs away. The person receiving the basket tries to catch the fleeing giver; if caught, a kiss is exchanged. But in modern day the day has changed to a more political day. Since 2006 it has been a day of protests. And I see from a Google Search that there are many planned for this May Day (2015). When I was young I had heard the expression about dancing around the Maypole, but I have never heard of an actual May Day celebration. Wouldn’t it be fabulous if the days of giving flowers came back around? 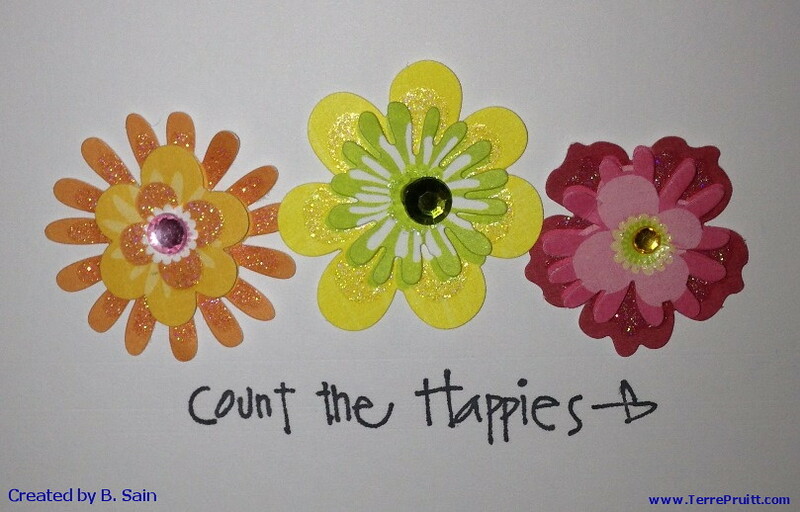 Do you celebrate May Day? Do you have plans for May Day? Have you EVER celebrated May Day? Saint Patrick’s Day. I assume that I learned about him and the reason for the day of celebration at some point in my life, but it is not one of those things I kept in my memory. So I checked out what Wiki has to say about it. I am often amazed at what things started out to be and how they evolved. Are you familiar with Saint Patrick’s Day? I know it to be a “Drinking Holiday”. I tell everyone I see to be careful — often times they reply, “I don’t drink.” And I remind them that it does not matter if THEY drink others do and so it does a body good to be careful. I remember this is the day that started my love for bagels. I had never liked bagels and especially cream cheese. Then one Saint Patrick’s Day the company I was working for at the time brought in some green bagels. I thought that was super funny so I tried one. So began my love affair with bagels and cream cheese. I don’t remember if the cream cheese was green, but the bagels were. So what is Saint Patrick’s Day? Well, according to Wiki Saint Patrick’s Day is celebrated on the day that the patron saint of Ireland, Saint Patrick died. It is also known as “the Feast of Saint Patrick” and “the Day of the Festival of Patrick”. In the early 17th century is “was made an official Christian feast day” and anything one gives up for lent can be consumed on this day. So lent takes the day off on Saint Patrick’s Day. Which could be why Saint Patrick’s Day has the reputation as a “Drinking Holiday”. It could be that I don’t know a lot about Saint Patrick because it sounds as if the information we have is not very concrete. The three left clover is thought to have been used by Saint Patrick to explain the Holy Trinity. And green was originally used in association with Saint Patrick but then someone started using blue but then it went back to green. There are big celebrations held throughout the world to celebrate Saint Patrick’s Day which is really a celebration of a man whose mission was to bring Christianity to Ireland. 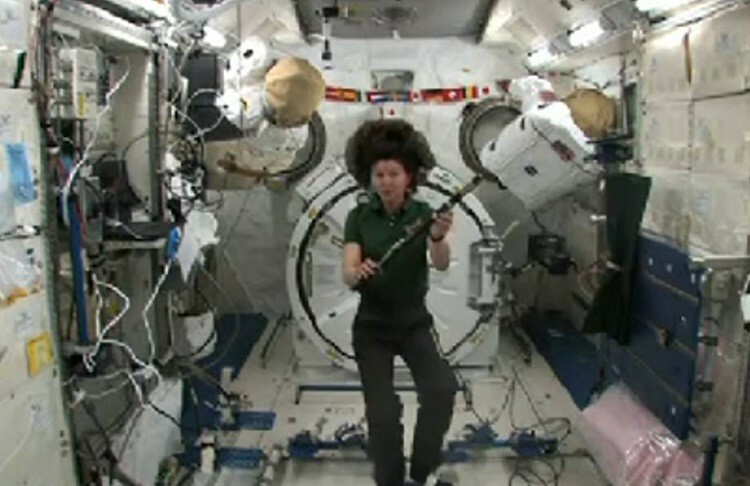 There are even celebrations “out of this world” as there has been Saint Patrick’s Day celebrations on the International Space Station by some of the Astronauts. (Click here to see Cady Coleman play an Irish Tune, 2011). Seems as if one of the biggest “Drinking Holidays” in the United States started out as a religious holiday. Which reminds me of something I heard on the radio this morning. The DJ’s were having a contest to see who knew the top five most popular drinking holidays in the United States. There was a survey done by Yahoo of 2,000 adults in the United States. The survey was called “Alcohol and America”. It took a few callers for this list to be guessed. Because Cinco De Mayo was one of the ones guessed first. Well, I hope everyone had a Happy and Safe Saint Patrick’s Day. And if you were like me you learned a little something. What did you do today? Did you wear green? Did you eat any green food? So our produce delivery has progressed into something kinda neat, but kinda not. You may remember me having posted about how I wanted to start receiving a produce box because we would receive farm fresh organic produce. But one of the main reasons I wanted to get a box was because I would end up with things I didn’t know what they were. Or I might know what it was but have no idea how to serve it. So it was a way to get organic produce but also “force” myself into new things. New fruits, new vegetables. Again – perhaps not TOTALLY NEW, but something I had never purchased because I didn’t know what to do with it. Well, that worked for a while. I was exposed to some new things and learned how to cook and/or serve some new things. I have acquired some new favorites and have learned that somethings I just don’t care to bother with. Well, the service has progressed as I started out saying. It is more like shopping now. The week before we are to receive our box I get an e-mail that allows me to pick and choose what I want. So now I am not getting things just arriving on my doorstep. I kind feel like they are just including standard stuff and if you want anything out of the norm you have to go choose it. So I am not being “forced” to try new stuff. Yes, I have the option to choose new stuff, but what really ends up happening is I get the e-mail and I think, “Oh, I can do that later, because I am busy now.” So I don’t go through the hassle of logging in and looking at all the produce available. Then next thing I know it is the night before delivery and it is too late to change the standard order. So . . . . like all progression there are pros and cons. I did happen to log on for our latest delivery and order something new to me. Watermelon Radishes. I love red radishes, but my digestive system and them don’t get along. They leave me feeling very uncomfortable so I don’t eat them. I sometimes buy them for my husband. I put them in his lunch. When I put them on his salad, I might take a piece and cut it up really tiny and put it on my salad, but I don’t even eat a whole radish. Just pieces. I didn’t know what a watermelon radish was. So I decided to get it. The information I glanced at prior to ordering stated it was sweeter than a regular radish. Well they arrived and they are huge in comparison to other radishes. Sort of, we also received regular radishes in this box and they were the biggest radishes I have ever seen. So I am experimenting with a watermelon radish. When I cut it, I took a piece for my hubby and I to try. It tasted A LOT more peppery than a regular radish AND it was sweeter. So either the ones we got were the typical ones described in the descriptions I read or the people writing the descriptions have a different idea of what “sweet” is than I do. Two sites I looked up this morning had the EXACT, word for word, description of what a watermelon radish is. I don’t know which site copied which site, but that is always disappointing to me. If a site states that the information is from another site, that is understandable to me, but just two sites, seemingly unrelated having the SAME EXACT information . . . bah! Now I am looking at a different site and it is saying that watermelon radishes are the same as Red Daikon. I have heard of red daikon before, but not watermelon radishes. I think of daikon as long vegetables. But round or long they are all radishes. The watermelon radish is a winter radish. Do you like radishes? Do you cook them? 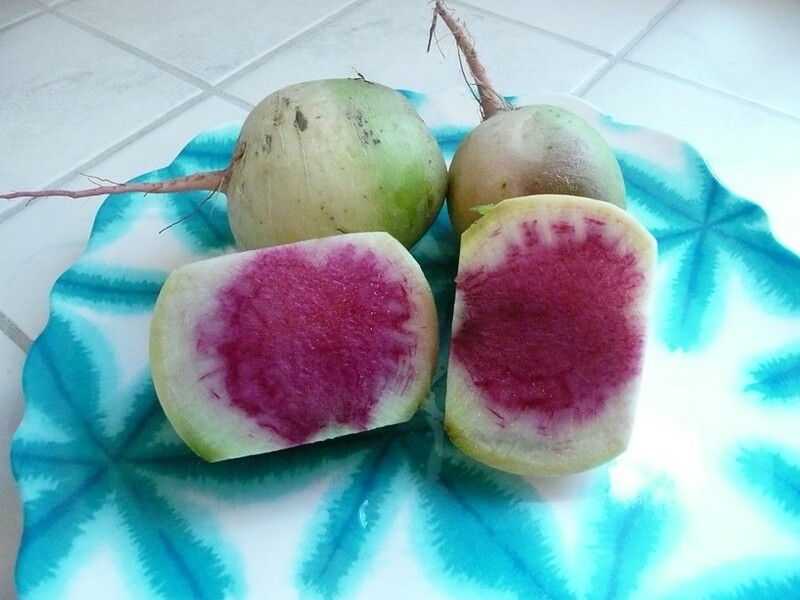 Have you had a watermelon radish? What to make for dinner is often a tough question to answer. My husband does not understand why it is so difficult. He doesn’t understand that when he eats ground turkey and a vegetable two nights (at least) every week for months it is because I just do not have the time or mental capability to THINK of something to make for dinner. Ground turkey and whatever vegetable we have is soooooo easy. But this past year I was told I made it too much. So . . . now that I have more time and can think about something other than planning a “memorial”, I am trying to come up with something else for dinner. On Thursdays I like to have something pretty much prepared before I go to teach the evening Gentle Yoga class. My hubby has been experimenting with making deviled eggs so we ended up with a lot of eggs. So I thought why not make a Frittata? Is it still a frittata if you don’t bake it in the pan you do the initial cooking in? I don’t have a cast iron skillet. Or pan that can go in the oven. Or — perhaps more accurately, one I want to put in the oven. But I just put my “frittatas” in a casserole dish. “Frittata is an egg-based Italian dish similar to an omelette or crustless quiche, enriched with additional ingredients such as meats, cheeses, vegetables or pasta. 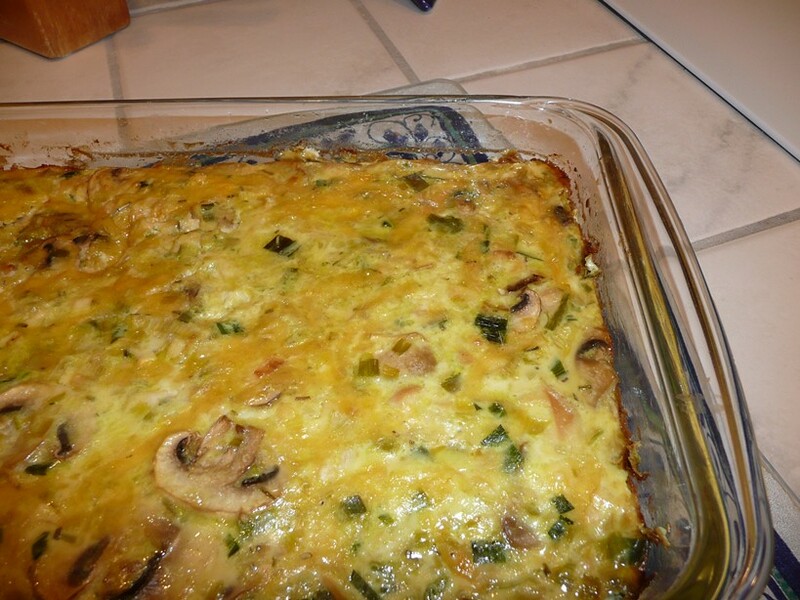 The word frittata is derived from Italian and roughly translates to “egg-cake”. Well, I had a small piece of chicken to use and a lot of eggs. So I bought some mushrooms and a leek. Here is our dinner tonight. Put about a tablespoon of olive oil in a pan. Heat the oil. Then add the leeks. Salt them a little while cooking. When they look as if they are getting cooked add the mushrooms to the pan. Add a little more salt. Add the rosemary. Add the garlic. Cook the leeks and mushrooms until they are almost done. While the vegetables are cooking beat the eggs in a large bowl. Add the milk. If you feel you need more salt and pepper you can put it in the egg mixture. Once the veggies are cooked add them to the eggs in the large bowl. Butter the casserole dish. Then pour the veggie-egg mixture into the casserole dish. Then add the chicken, use a fork to spread the chicken around in the vegetable-egg mixture. Then sprinkle the cheese evenly over the top. 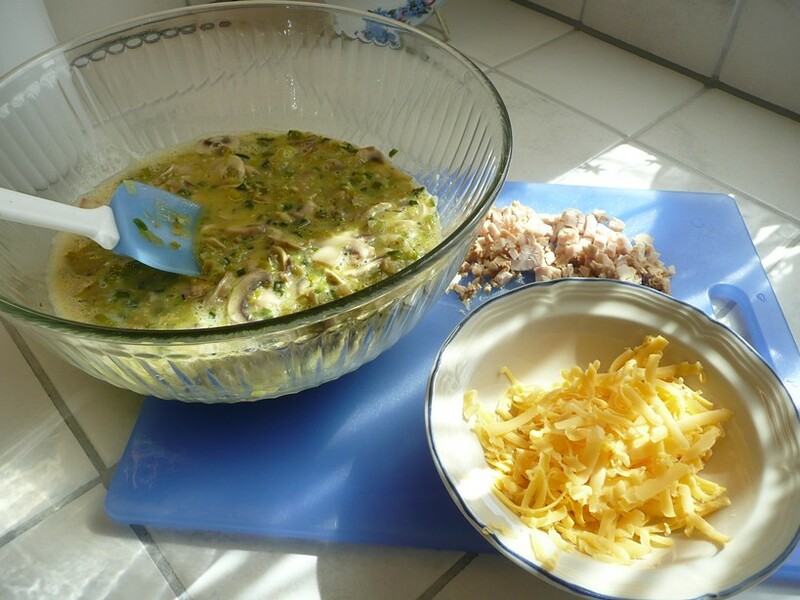 With the fork sink the cheese into the vegetable-egg-chicken mixture. Bake on 350° F for about 20 minutes. After 20 minutes check it to see if it is done to your liking. Usually you want eggs to be cooked thoroughly. But everyone likes their eggs done differently so cook it to the way YOU like it. Of course this can be breakfast, brunch, lunch, linner, dinner, a snack . . . . whatever you want. I am sure you can adapt it to one pan cooking like a “real” frittata, but . . . it works in a casserole dish too. Do you like frittatas? Do you ever eat them for dinner? A Breathe Of Fresh Caffeine? Wow, you might not believe I have more “stuff” going on. More on that later. I am sure I will write a post or two. You know I always share, it just takes some time sometime. So, instead – highlights of my day: a student who has been away from my Nia classes for a bit came to class today. That was wonderful, unexpected and very timely. Another student in one of my yoga classes came to class with his own mat. That put a huge smile on my face. I took that as a sign that he is “into” it. Later when I told him I was so happy to see him have his own mat, he said, “Yeah, I got to stick with it!!! !” Thrilling! Yes, gotta keep looking at the bright spots. While perusing my cache of “topics to post about”, I came across one I found interesting. Could be something you are aware of, perhaps I had heard of it too, but forgot. I think the studies were done in 2009. Did you know caffeine could, possibly, help people with asthma breathe better? The small study of 75 people with mild to moderate asthma was done. Six trails showed 55 people had improved lung function for up to fours hours after consuming caffeine. A study at the Indiana University show that caffeine an hour before exercise can significantly reduce exercise induced asthma. I cannot find a link to the Indiana University study, but there are numerous articles about it that surface when a search is done. One article on ScienceDaily said that it was LARGE amounts of caffeine that were used in this study. The article stated “9 milligrams of caffeine per kilogram of body weight”. Ok check my figuring on this using the information from the Mayo Clinic regarding a regular brewed cup of coffee, which is 8 oz brewed coffee has 95-200 mg of caffeine. That is a big difference, but that is ok, it will still work in my “figuring”. Let’s use the top, 200 mg of caffeine in a cup of coffee. Well, lets say average man is 80 kilograms (176.37 pounds), that would be 720 mgs of caffeine. That is roughly 4.5 cups of strong coffee. Is that right? The article also said that smaller amounts – 3 mg – 6 mg per kilogram of body weight “also reduced the wheezing, coughing and other symptoms of” exercise induced asthma. Interesting. I know many people who use caffeine to help fuel their workouts. I know many people who use caffeine to help fuel their day. So, while I am by NO MEANS saying to use caffeine instead of any physician prescribed medication for asthma . . . I just think it is interesting. Since it could be that many people with asthma are drinking coffee anyway. I just like when I come across tidbits of information.